A building plot for sale with planning permission for a large contemporary four bedroom detached house with three reception rooms and a huge kitchen breakfast room with two sets of 'Z' fold doors, quite literally bringing the garden into the house. The house is approximately 225m² or 2400sqft plus a double width garage. The anticipated value of the house when completed would be in the region of £925,000. Steeple Morden is a lovely village on the outskirts and within easy reach of Cambridge and Baldock; there is a lovely pub and a station close by at Ashwell with a regular service to London and Cambridge. Lounge: Approx 6.5m x 4.5m (21' 4" x 14' 9") Open fireplace with a full 5 metre width of glass with two folding doors. Kitchen Breakfast room: Approx 4.5m x 4.5m (14'9" x 14'9") with 2.8 metres of glass 'Z' folding doors. Family Room: Well proportioned measuring approx 4.5m x 4m (14'9" x 13'1"). Study/Playroom: Approx 4m x 2.5m (13'1" x 8'2"). Master Bedroom: Approx 5m x 4.2m (16'5" x 16'5"). Bedroom 2: Approx 4.7m x 3m (15'5" x 9'10"). En-suite: Approx 2.8m x 1.2m (9'2" x 3'11"). Bedroom 3: Approx 4m x 2.9m (13'1" x 9'6"). Bedroom 4: Approx 3.1m x 2.7m (10'2" x 8'10"). Family Bathroom: Approx 3.1m x 1.8m (10'2" x 5'11"). Double width garage measuring approx 6.5m x 6m (21'4" x 19'8"). Garden: The garden is approx 122m² (1313sqft) approximately 14.05m (46' 0") wide and 14m (45'9") deep. Driveway: Measuring 4m (13'1") at the narrowest and approx 12m (39'3") long. Disclaimer - Property reference 13081560. The information displayed about this property comprises a property advertisement. Rightmove.co.uk makes no warranty as to the accuracy or completeness of the advertisement or any linked or associated information, and Rightmove has no control over the content. This property advertisement does not constitute property particulars. 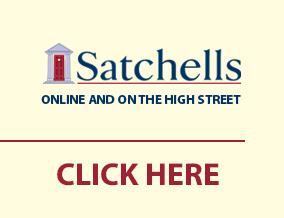 The information is provided and maintained by Satchells Estate Agents, Hitchin. Please contact the selling agent or developer directly to obtain any information which may be available under the terms of The Energy Performance of Buildings (Certificates and Inspections) (England and Wales) Regulations 2007 or the Home Report if in relation to a residential property in Scotland.